This morning I was on WISC-TV 3 for News 3 This Morning. 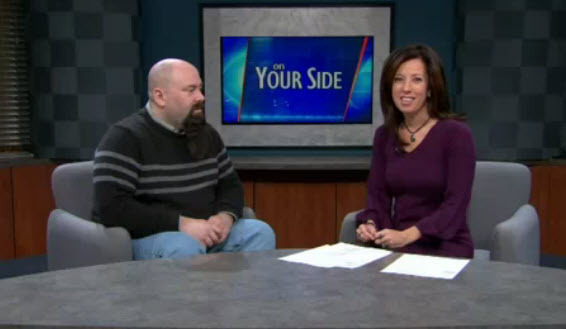 I talked about Cyber Monday deals for a 3 minute segment at 6:20 am. Charolette Deleste interviewed me for this segment. We started out talking about the history of Cyber Monday. Simply put – 10 years ago, with a lot of homes not having a good internet connection, and a big bulky computer in the public area – Not to mention the kids running around so you can’t shop for their gifts – most people reverted to Monday at lunch time to do their shopping. However, this year we saw a jump in sales because retailers used the whole weekend to give deals. Add to that, a 14% increase in people using their mobile devices to make purchases this weekend, they had a great Black Friday weekend. So now Cyber Monday is here. Charolette asked which websites we should look to for deals. First, the websites you have been look towards for Black Friday deals should also be doing Cyber Monday deals. However, Cybermonday.com, cybermonday2011.com, and cyberweek.com are some good websites to watch for. Also, check out Amazon.com – they have been doing new deals every 15 minutes. The next question was about apps for the iPhone or Android. Once again, I mentioned the apps you used for Black Friday will also be posting Cyber Monday deals. However, TGI Cyber Monday app, as well as the Amazon Scan app for Apple or Scan app for Android – which will let you scan bar codes to find a better price to an item. It was a great time and I would like to thank the staff at WISC-TV 3 for the time on air, as well as Charolette for giving me the opportunity. The video will be up later today on Channel3000, as well as on the Channel3000 Roku Channel. Of course, it will also be up on Geekazine once the embed code is available.